Four attempted bombings in London were designed to kill people, the head of the Metropolitan Police has said. The attacks came exactly two weeks after the explosions in the capital which killed over 50 people. Again devices were left on three Tubes and a bus but this time it is believed they only partially exploded. Scotland Yard commissioner Sir Ian Blair said no-one had been taken to hospital after the blasts, which were minor and almost simultaneous. "The intention of the terrorists has failed", he told reporters. He added: "There is a report of one casualty at one hospital... who may or may not be connected to this." Two men, one arrested in Whitehall, close to Downing Street, and another around Tottenham Court Road, have been released without charge. BBC home affairs correspondent Margaret Gilmore said the inquiry was still at an early stage but she thought it likely that CCTV images would be released shortly. Sir Ian said evidence left at the scenes could be very helpful to police. An eyewitness at one of the affected tube stations spoke of hearing a bang and seeing a man with a rucksack flee the scene. Mayor Ken Livingstone praised the emergency services and said the people of London would "get through this". The attacks took place almost simultaneously, at about 1230 BST. London's transport system was quickly thrown into chaos, with a number of Tube lines closed and roads shut off as cordons were established. At Warren Street Tube station witnesses reported hearing a bang at the front of a train, creating some panic among passengers. Armed officers were twice deployed to nearby University College Hospital, following reports that someone had run away from Warren Street. Three unoccupied rooms in the hospital remained cordoned off on Thursday evening. Police later said they believed two people who had been arrested in the area were unconnected to the blasts and had been released. At Oval Tube station about 20 or 30 passengers were evacuated from a train after seeing "white smoke". The RMT union's security meeting was told the suspect used a handgun to try and detonate explosives contained in a backpack, BBC London Transport correspondent Andrew Winstanley said. There were reports that bystanders tried to tackle a man as he fled the station. 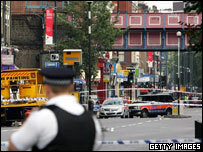 At Shepherd's Bush a man was reported to have fled after the attack, on the Hammersmith and City Line. On a Number 26 bus on the Hackney Road there was an explosion on the top deck. The windows of the bus, which was travelling from Waterloo to Hackney, were blown out, although there was no structural damage. 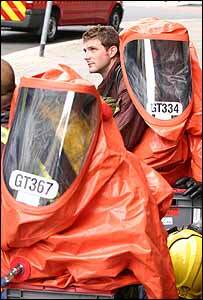 Tests for chemical, biological and radiological weapons at all four sites proved negative. Many residents in areas near the Tube stations affected are still not able to return to their homes, with many waiting in community centres for the all-clear. Sir Ian said there was a "resonance" with the bomb attacks which killed 52 people two weeks ago, but that it was too early to draw any conclusions about whether they were linked. The four bombers died in those attacks. He said important information could be recovered by forensics experts. "From what I understand, some of the devices remain unexploded," he said. Former government intelligence analyst Crispin Black said the possibility of examining the devices was significant: "This, in forensic terms, is bingo, this is as good as it gets." BBC security correspondent Mark Urban said initial indications were that the devices were put together in a way very similar to those used two weeks ago. He said there were suggestions that the rucksacks themselves, as well as the choice of three tube trains and one bus as targets, all suggested a similar method of attacks. There was also speculation that the devices were so similar to those used two weeks ago that they may even have been part of the same batch. One eyewitness at Oval tube told how she heard a "big bang, like a balloon had popped but a lot louder" and the passengers moved away into another carriage. "There was a guy still standing in the carriage. "We pulled into Oval, we all got off on the platform and the guy just ran, started running up the escalator. "Everyone was screaming 'someone stop him." Sir Ian warned against "smearing" any particular community with the blame for Thursday's attacks. "These are criminal acts and we are in pursuit of a set of criminals," he said. Prime Minister Tony Blair urged people to carry on as before. He said: "Everyone is canny enough to know what these people are trying to do....and that is to intimidate people and to scare them and to frighten them to stop them going about their normal business." Ken Livingstone said he was not surprised London had been attacked again. "Those people whose memories stretch back to the 70s, 80s and 90s will remember there were horrifying bombing campaigns in London," he said. "We got through that and we'll get through this." Mr Livingstone backed a police appeal for information on who may have been behind the attacks. He said religious leaders should remind their congregations of the immorality of what had happened and that people should come forward even if the was only "a remote possibility" that they could help catch those to blame. Police have asked that any images of the attacks are sent to www.police.uk. The hotline number for anybody with information is 0800 789 321. Witness reception points have been set up near the four scenes.